Parenting is one of the toughest, yet also one of the most underrated jobs in the world. While there’s no doubt it brings a lot of joy and happiness, it’s common for parents to often feel like they’re stuck in a daily grind of stress, frustration and exhaustion. The trouble is, if you find yourself constantly feeling this way, there’s the chance it can lead to burnout. While parenting will always be hard, there are ways you can get through it with your sanity intact. 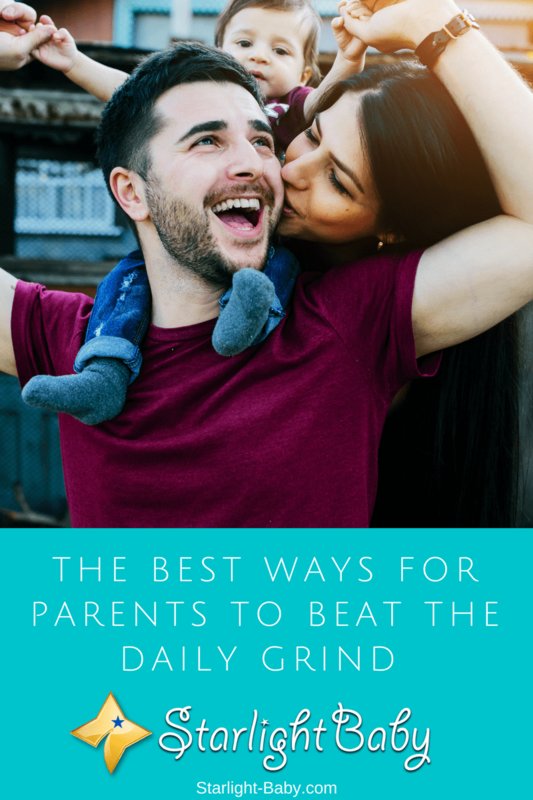 So, if you’ve been feeling like you’re stuck in a never-ending rut, here you’ll discover the best ways to beat the daily grind. When was the last time you caught up with friends? Many parents find as soon as their child comes along, they get so caught up in the daily grind that their friendships simply filter out. It’s not easy keeping up friendships when you’re constantly exhausted and feeling overwhelmed. However, reconnecting with friends could be just what you need. Numerous studies have been carried out over the years which have proven friendships are key to happiness. So, if you’ve noticed your own friendships have been hit by the daily grind, now’s the time to take action. Make a lunch date with a friend you haven’t seen for a while. Enlist the help of a babysitter and treat yourself to a night out with friends. Or, arrange playdates if you can’t find anyone to watch your little one. There’s no denying it’s definitely harder to maintain friendships when you have children, but it’s not impossible. When you’re stuck in the daily grind, you’ll likely find your sleep pattern is totally messed up. Of course, sleep is already so hard to come by when you’re raising a baby or toddler. The trouble is, these sleep issues could be adding a huge amount of stress onto your day. So, how can you fix it? There’s a lot of techniques you can try out to improve your sleep pattern. Getting to bed earlier is by far one of the best things you can try. The more sleep you can get, the less stressed out you’ll feel. Aromatherapy oils are great for helping you to get to sleep too. Try spraying your pillow with Lavender or using a humidifier with Lavender oil to produce a calming, sleep-inducing aroma. Exercise can also help you to beat the daily grind. However, as a busy parent it’s understandable you may not have found the time to exercise. Or, you may have been so busy running around after the kids all day you really don’t need any additional exercise! If you are on your feet a lot, it is possible you’re getting enough, but if you feel you aren’t you may want to consider taking up yoga. There are different forms of yoga, but each offer incredible benefits. It’s awesome for stress relief and can really help you to calm the mind and body. This in itself could actually help you to sleep better too – killing two birds with one stone. It’s best to attend local yoga sessions as that way you’ll be doing your exercise while getting out of the house and away from the family for a little while. If that really isn’t an option, consider a yoga DVD which you could do from the comfort of your own home. Of course, any type of exercise is beneficial so if yoga isn’t your thing, find something that is. However, if you’re willing to give it a try, you may just be surprised by how calming and amazing yoga can make you feel. Just like friendships, it’s not surprising romantic relationships also suffer when you become a parent. Reigniting the romance in your life could be just what you need to beat the daily grind. If you have a partner, make time for one another. Try and have at least one date night a week. You don’t have to go anywhere or spend much money, just spending time together could be all you need to get the spark back. If you’re single, consider dating. Sure, you have a child to look after, but that doesn’t mean you can’t have a love life too! Adding a little romance to your life can make it so much better. Of course, if you’re happier single, that’s awesome! But if you do feel you need a love life, now’s the time to start working on it. Never be afraid to ask for help. Whether it be from friends, family or your partner – Sometimes a little help is needed to overcome the daily grind. If you’re constantly exhausted because you take care of everything, ask the family to get involved. Even toddlers can help a little around the house, and you’ll typically find kids love to get involved. It makes them feel grown up and they genuinely like to be useful. Could your partner take on more in the house, or maybe watch the kids while you get on with something else? When you’re trying to do everything yourself, it’s not surprising you’ll start to feel run down and stuck in the daily grind. Do you constantly seem to be taking your child to classes and their friends’ houses, as well as school? It’s common for children to have a hectic social calendar these days and you feel compelled to do it all. However, if it’s taking over your life don’t be afraid to cut back some of their commitments. Take a look at the activities you could possibly drop from their calendar. One less class to take them to can make a significant difference to how you feel and what you can achieve in a day. When was the last time you had fun? It’s easy to get so caught up in the tough side of parenting, that you forget to simply have fun as a family. Always take time to enjoy your family. Make memories, go for walks, head out on a day trip, take a family vacation – just have fun together! Breaking out of the daily grind can be tough, but if you don’t, you’re never going to live a happier, more fulfilled life. So, follow the advice above and see just how much of a difference it can make to your daily life. Have you ever felt caught up in the daily grind? How did you overcome it? Share your stories below! Currently pregnant and feeling stagnant socially. Been dreading the changes in life once the baby is born. I will remember all the tips you’ve given. I hope motherhood is not as taxing as I expected it to be. Wow! You’ve been stagnant too early. I became like that after my first baby was born. I would say, try to socialize now while still pregnant. You will be too pre-occupied with your baby after you give birth (at least for a few months). Also, expect the worst when you become a mom! haha… It is a worthy cause, believe me, but there will be days when a baby could drive you nuts and find everything too overwhelming so try to relax when you find yourself in such a situation. Starting up a family and having babies changes a lot of things from being normal to almost wired for parents because they are likely to find it difficult adjusting to their old life as the baby makes it almost impossible. The messy sleeping pattern is such a huge problem for parents once the baby comes around. This makes it hard for the mother especially to get a decent rest. You mentioned “….. Aromatherapy oils…” how does it really help? I hope it doesn’t have any side effects? You got me laughing with your comment about “being normal to weird”, haha. Yes, I do think that’s one way of looking at it. Having a baby totally disrupts all things normal in one’s life and make it a wonderful (sometimes) mess. I’ve used them before and they really do have calming effects and could help parents who need to relax and rest. It is always difficult for new parents to adjust and I think this is the type of advice that they really need in order not to be stressed up to the limit after the child has come. Creating a time to connect with old friends can help us to feel the good old times and the need to feel relaxed away from the activities that come with having a baby around. Also, ensuring that our romance life is too notch is a good way to enjoy more good times as well. I found this information on the article quite helpful as well. So true, Henrywrites. Parents should never set aside their friends when they already have a baby because friends could hugely help them relax from the craziness of parenthood. And yes, never set aside the romantic feelings between husband and wife because doing so could set them apart instead of making them closer. If you are a working parent, there is no way you would be able to coordinate and manage your family with your job and always remain sane. The best possible option for you is to get help or ask for help as it’s discussed above. There is absolutely nothing wrong with getting help to aid with the family chores and baby upkeep as you try to rein in your job with the family as well. It helps you not to abruptly breakdown all of a sudden. From my experience with nanny and house helps, it’s more better to have your immediate family members be your nanny or house help because they would have the best interest for you and your baby at heart. I’m not saying that all professional nannies out there are evil but it’s hard to find a good person these days. Getting or asking for help is good but care much be taken with who you are asking the help from. Yes, Martinsx. Due diligence in choosing a house help or nanny should be observed when choosing one because they will be entrusting their child’s life to a total stranger. Unfortunately, most people do not have relatives with whom they can entrust their child’s care so their last resort is a nanny. I agree with you that there is nothing wrong with getting help from others as regards taking good care of their home. That is what mom did when she was pregnant with my little brother by getting a house help that was there all through to take good care of us. I totally agree with getting help if both parents work. They just need to be sure that the help is trustworthy, caring and will not maltreat the child. This is really important because both parents will not be around to see how the baby is being treated. As a work from home dad, my life has been quite messy in the last 18 months, from the day when my wife tested positive and until now when the baby is 10 months. I have not been able to think about anything except my wife and the baby. Some of the ideas explained here are really interesting and I might use them. I will first try with getting back to friends. I have not met my friends since a year and half. Oh, my! It’s about time you mingle with your friends again. A year and a half is a very long time to be out of touch. Get a life! You’ve done your part as a good daddy so it’s time to spend time for yourself, your own “me time”. I would say most mothers would rather stay home and take care of their babies. It is difficult to decide to leave one’s career but our babies are worth all the sacrifice. Unfortunately, not all moms/dads can do this because of financial difficulty, especially single moms or dads.